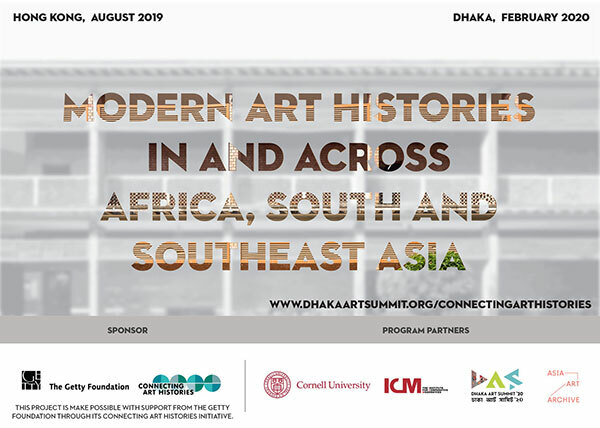 The Dhaka Art Summit, a research and exhibition platform for art from South Asia, Institute for Comparative Modernities(ICM) at Cornell University, and Asia Art Archive launch a new research project entitled ‘Connecting Modern Art Histories in and across Africa, South and Southeast Asia’. This is supported by the Getty Foundation’s Connecting Art Histories initiative. The three regions include the similar rise of modern art practices associated with the withdrawal of colonialism and the consolidation of nationalism, the founding of institutions such as the art school and the museum, and increasing exchange with international metropolitan centers via travel and the movement of ideas through publications and exhibitions. Viewing this in terms of statist and national art histories obscures their analysis in a comparative framework. By contrast, this program emphasizes a connected and contextualized approach to better understand both common developments as well as divergent trajectories. Application period ends on 28 February 2019.